If you are new to the Western Mediterranean or want to expand your horizon, then this is an indispensable guide and pilot book. Tells you about the hazards and best routes as well as information about the area. If you come down the French Canals and are then heading for Southern Spain there is a special section on the best routes and places to stop over. 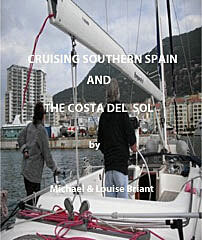 With this book you do not need any other pilot books for the area on board. Theoretically they also monitor VHF 16 but in practice most offices do not remember to switch it on..
To use your mobile phone to talk to them, from the boat at sea, is perfectly normal and that’s what most ‘locals’ do. Almost always there is a ‘waiting berth’ near the office and entrance to the marina and most also have a fuel dock alongside the waiting berth which you should only use if you intend fuelling up. You can expect a ‘marinero’ (sailor in Spanish) to take your lines at the waiting dock and when you finally park up. The paperwork is completed in the marina office and a copy of it handed to the Guardia Civil at the end of each working day. 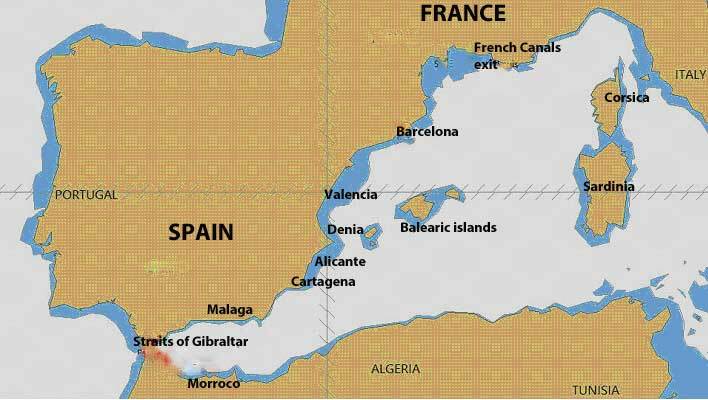 The Guardia Civil enter the details in their computer and track all foreign pleasure yachts whilst they are in Spanish waters. ,,,,,,,To be more precise you have come south through the canals to the River Saône and down to Lyon. Then you have entered the mighty Rhone River with its huge commercial locks and headed south with the current to near Arles, where you make the decision to either hang a right and use the canals to get to Sete, or carry straight on and take the very straight tree lined canal to Port St Louis. ..........There are two main routes into the Mediterranean if you exclude the option of buying a boat already located there, which can have it’s own issues, or sticking it on the back of a lorry from the UK. 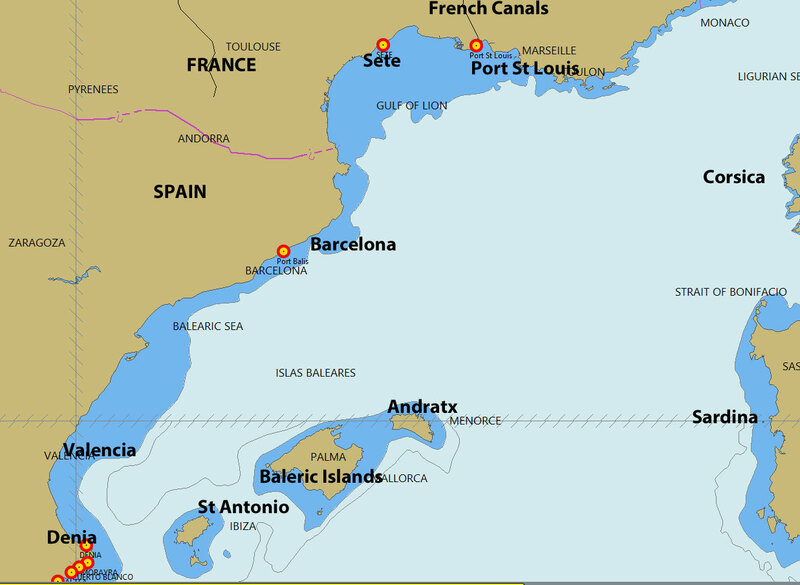 The most romantic and enjoyable, if your boat is a suitable size, is from the English Channel via the French Canals and Rivers into Port St |Louis or Sete on the Southern French Coast. If you are heading for the Balearic Islands and the Costa del Sol then you will head for Sète and the Port de Plaisance de Sète. If you have your mast on deck, then both places have cranes to put the mast back up for you. Port Napoleon probably has a more full on service for masting and de-masting and you can send your mast by road from the French Channel port you entered the canal system to Port Napoleon to await your arrival.